CSA #12c (AD) Greenish-Blue Horz Gutter Pair UNUSED (4-Margin) OG NH. Light fold in the gutter as is usual. Light vertical crease or fold in the right stamp. State of Virginia, City of Richmond 75c Fractional note 1862 (pinholes) Fine. USA Star Die with a Grid Cancel and the Aberdeen, Miss CDS 28 MAR (1861) (USA Used in CSA Mississippi). Addressed to James G. Stewart, Mobile, Alabama. Clean cover. CSA #7 Gutter Block of 8 UNUSEDfrom the very bottom of the sheet (4-Margin but close on the left witha large lower sheet margin) OG and Hinged at the top. Usual light foldin the gutter. The four stamps on the inside of the gutter showfilled-in frames and the four stamps across the bottom show partially filled in frames. Very Fine. CSA #8 Horz Strip of 4 USED (margin touches at left). The strip appearsto have been canceled by a period manuscript “(Mon)tpelier NC Jun 26th.” This was most likely originally a strip of five but one stamp has beenremoved some time in the past. Interesting item which certainly appears tobe genuinely used with a manuscript town mark but difficult to prove offcover. CSA #12 (AD) (4-Margin) tied by a very nice strike of the RED Social Circle, GeoCDS 2 MAY. Coarse brown paper cover with Military Address to Capt J. B.Fulton, Greensboro, Ga. Captain Joseph B. Fulton was a staff officerand the "CSA Agent" (most likely a quartermaster) in Greensboro, Ga.Very Fine Cover. CSA #7 UNUSED (4-Margin) OG NH Gum cracks. 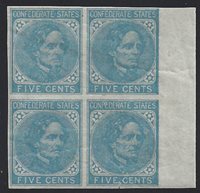 CSA #7 Horz Pair on London De La Rue Paper UNUSED (4-Margin) OG NH Very Fine. CSA #1 Stone 2 Position 45 (margins a little irregular) tied by the Yorktown, Va CDS 21 JAN (1862). Addressed to Miss Edmonia A. Bett, Liberty, Bedford County, Va. Very clean cover. CSA #16x1 Charleston 5c Blue Provisional USED Type B(4-Margin with full outer frames at top and bottom, a full double outerframe at right, and part frame at left) with the large single rim Charleston SCCDS 23 SEP 1861. 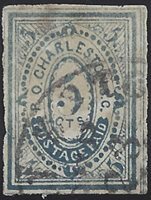 Unusual two-tone blue color with the bottom half ofthe stamp a darker blue than the top half. Hinge thin and a minor edgeirregularity at leftwhich do not detract from the appearance. CSA #11d (AD) Green UNUSED (4-Margin) No Gum, Small Hinge Remnant, Very Fine. $2.00 Note The State of North Carolina (Cr-13) 1861. Plain Paper and Plain Back F-VF. CSA #1 Stone 2 and CSA #4 Stone 2 USED inCombination for the double rate over 500 miles (both stamps are 4-Marginbut the CSA #1 overlaps the top part of the CSA #4) tied to each other and toa small blue paper piece by two strikes of the Mobile, Ala double circleCDS 18 MAY (1862). Excellent combination piece. 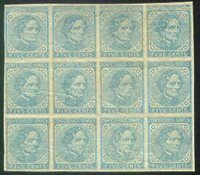 CSA #7 Block of 12(3 Rows of 4) UNUSED(4-Margin showing a very coarse printing with multiple random printingflaws) OG NH with gum creases. The Bank of the State of South Carolina 25c Fractional Note 1863. Palmetto Tree (center) XF-AU. Soldiers DUE 10 Type P with the Richmond, Va CDS Powell Type 6m 9 MAR (1864). Endorsed "R. Gatewood Chaplain" and addressed to J. S. McDade Esq, Cedar Grove NC. Period manuscript "Missent to Chapel Hill NC. "Rev R. Gatewood was a Protestant Episcopal clergyman who served nsRichmond as a CSA army chaplain for Virginia units. Very Fine missentcover. CSA #4 Stone 2 Position 1 (4-Margin with just a little edge gum toning at the top) tied by the Wilmington NC CDS1 APR (1862). Addressed to Mr. James Robeson, Prospect Hall, BladenCounty NC. Sealed edge tear at the upper left. Clean Cover. CSA #7 Block of 4 on London Paper UNUSED(4-Margin with right sheet margin) filled-in frames at the right OGwith top two stamps Hinged. Pencil notations on the reverse identifiesthe stamps as from Positions 49-50, 59-60. CSA #12c (AD) Greenish-Blue (margin close at the left) tied by a full strike ofthe Selma, Ala CDS 4 DEC. Addressed to Genl W. P. Bocock, Prest A &M RRR Co (Alabama and Mississippi Rivers Railroad Co.), Demopolis, Ala.Not sure of the meaning of the title "General," but it was certainlynot associated with the Confederate Army and was most likely honorary.Semi-Ofiicial Imprint at the upper right "OFFICIALQuartermaster's Department, Selma, Ala." (WD-QM-14) in the CSA Catalog). Very Fine. CSA #62x4 New Orleans 5c Red-Brown on Bluish Paper Provisional Vert Strip of 3 USED (margins tight top, left, right) tied to small piece by two strikes of the New Orleans, La CDS 15 OCT (1861). Very attractive item representing a 3x rate.